Long or Short Jumpsuit from Mimi G This long or short jumpsuit for miss is a must have item from Mimi G Style. 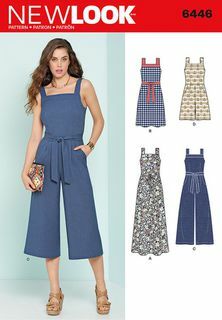 Pattern includes long slim jumpsuit, or short jumpsuit with one arm and asymmetric overbodice, or short strapless jumpsuit with tie belt. 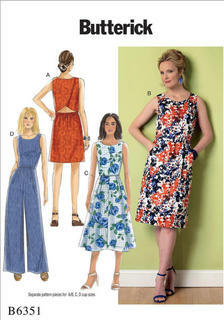 Simplicity 1355 This Easy-to-Sew pattern includes long dress and long or short jumper. Neckline options are v neck or scoop with sliding tie. Back is either are crossover or slit - see front/back view tab for details. 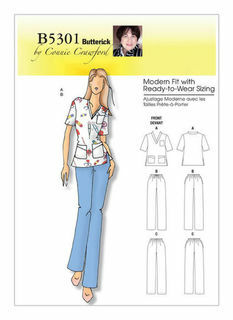 MISSES' JUMPSUIT: Jumpsuit has collar, loose-fitting, blouson bodice, elasticized waist, inside front extension, side-front pockets, and invisible front zipper. A: Stitched hems. B: Hem facings stitched in place. FABRICS: Drapey Woven or Knit, Ponte Knit, Challis, Crepe. *With Nap. **Without Nap. Unsuitable for obvious diagonals. NOTIONS: 22" Invisible Zipper, 1" Elastic: 1 yd. for sizes A, B, C, D, E and 11/2 yds. for F, G, H, I, J, 1/4 yd. of 1" Grosgrain Ribbon (Optional), WonderTape™, Steam-a-Seam®, Two Strips of 1" x 22" Fusible Interfacing. MISSES' SLEEVELESS WIDE-LEG JUMPSUIT Semi-fitted, lined, wide-leg, sleeveless jumpsuit (close-fitting through bust) has front extending into back collar (cut on crosswise grain), and invisible front zipper closing. FABRICS: Sequin Mesh, Crepe, Matte Jersey. Lining: Charmeuse. NOTIONS: 14" (36 cm) Zipper. MISSES' BISHOP SLEEVE JUMPSUIT AND BELT Semi-fitted jumpsuit has sleeves gathered into buttoned cuffs, front invisible zipper closure, front side pockets, back welt pocket, and self-belt. FABRICS: Silk Shantung, Crepe de Chine, Rayon Blends. Unsuitable for obvious diagonals. NOTIONS: One 14" (36 cm) Zipper, Two 1/2" (1.3 cm) Buttons, One 5/8" (1.5 cm) Covered Buckle with Prong, 3 yds. (2.7 m) of 1/4" (0.6 cm) Double-Fold Bias Tape. MISSES' OPEN-BACK, BANDED JUMPSUIT Jumpsuit is close-fitting through bodice with open back, buckled back band, stand-up collar, and exposed separating zipper closure. Semi-fitted pants on jumpsuit have back welt and side-front pockets and invisible zipper closure. 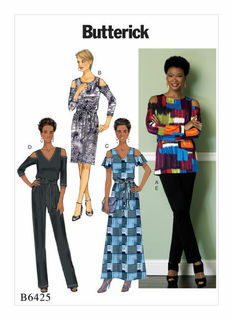 Separate pattern pieces are included for cup sizes A, B, C, D. FABRICS: Crepe, Rayon Blends, Crepe-Back Satin. Contrast: Moderate Stretch Knits: Stretch Crepe, Ponte Knit. Unsuitable for obvious diagonals. NOTIONS: One 1" (2.5 cm) Parachute Buckle, One 9" (23 cm) Separating Zipper, and One 7" (18 cm) Invisible Zipper. Pullover tunic has asymmetrical hem; wrong side of fabric will show. Close-fitting jumpsuit has contrast knit bodice with lingerie strap slides and rings, side snap closure, and flared legs. Contrast B: For moderate stretch knits only. FABRICS: A: Chiffon, Organza, Georgette. B: Moderate Stretch Knits (35% Cross Grain): Stretch Crepe, Scuba Knits. Contrast B: Tricot, Lightweight Jersey. Unsuitable for obvious diagonals. *With Nap. **Without Nap. MISSES' PANTS Very loose fitting pull on pants have elasticized back waistband, front pleats and pockets. A: Front and back wide straps give jumper effect. FABRICS: Unsuitable for obvious diagonals. *With Nap. **Without Nap. Crepe, Drapey Rayons, Washed Linen. Note: Fabric requirement allows for nap, one-way design or shading. Extra fabric may be needed to match design or for shrinkage. NOTIONS: A, B: 11/2 yds. (1.4 m) of 3/4" (2 cm) Elastic, 1/2" (1.3 cm) Lite Steam-a-Seam™, Stay Tape. A: 1/2 yd. (0.5 m) of 1" (2.5 cm) Braid Trim. MISSES'/MISSES' PETITE JUMPSUIT Underlined, lined jumpsuit is close fitting through the bust with pleated wide-leg pants, back zipper, and ribbon ties. FABRICS: Unsuitable for obvious diagonals. Lace, Linen, Silk Jacquard. Contrast: Crepe, Poplin. Underlining/Lining: Crepe de Chine, China Silk. Note: Fabric requirement allows for nap, one-way design or shading. Extra fabric may be needed to match design or for shrinkage. NOTIONS: One 7" (18 cm) Zipper, One Hook & Eye, 3 yds. (2.7 m) of 1" (2.5 cm) Grosgrain Ribbon, 11/2 yds. (1.4 m) of 1/2" (1.3 cm) Double Fold Bias Tape, 11/4 yds. (1.2 m) of 1/4" (0.6 cm) Ribbon. 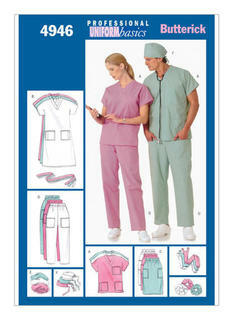 Men's/Women's Scrubs Uniforms (Dress, Belt, Top, Skirt, Pants, Hat and Ponytail Holder) Loose-fitting, A-line, pullover dress, above mid-knee or top has neckbands, pockets and cap sleeves. A: Side slits. B: Back-wrap bodice, tie ends and belt. 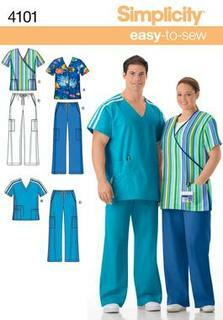 Semi-fitted, straight skirt, mid-knee or slightly tapered pants have elastic waist and pockets. All have narrow hem. Hat E: Elastic. Hat F: Tie ends. Stethoscope cover has elastic and Velcro®. Ponytail holder has elastic. FABRICS: Lightweight Broadcloth. Unsuitable for obvious diagonals. NOTIONS: Dress B (Misses'): Seam Binding. Skirt C (Misses'): 1 yd. (1.0 m) of 1" (25 mm) Elastic. Pants D (Unisex): 11/4 yds. (1.2 m) of 1" (25 mm) Elastic. Hat E: 5/8 yd. (0.6 m) of 1/4" (6 mm) Elastic. Hat F: 1/2" (13 mm) Single-Fold Bias Tape. Ponytail Holder: 1/4 yd. (0.2 m) of 1/4" (6 mm) Elastic. 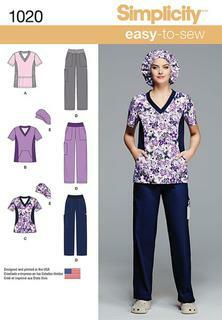 Misses'/Women's Scrubs Uniform The V-neck scrub top features comfortable t-shirt ease, shirt sleeves and styled pockets. The specially fitted sleeves allow more arm movement for a full-figured woman. 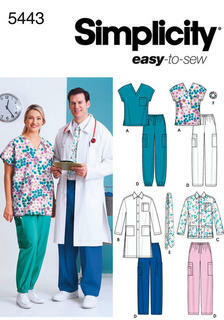 A: Two patch pockets and one chest patch pocket. The elastic waist pants with side seam pockets have been specially drafted to fit the correct waistline slant of a full-figured woman. Directions for a drawstring waistline are also included. B: Drawstring waistband. C: Elastic waistband. 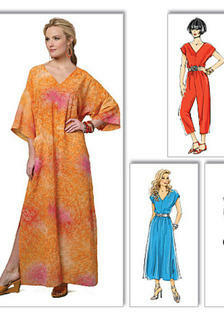 MISSES' TOP, DRESS, CAFTAN, JUMPSUIT AND PANTS: A, B, C, D: Very loose-fitting. A, B, C: Pullover. D: Side seam pockets. E: Loose-fitting, pull-on pants with tapered leg. FABRICS: Lightweight Broadcloth, Crepe de Chine, Jersey. 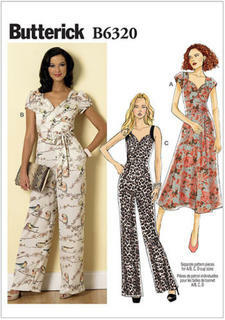 MISSES' DRESSES AND JUMPSUIT: Dress and jumpsuit (loose-fitting through bust) have bias collar, lined bodice and midriff, and back zipper. A: self-lined sleeves. A, B and C: princess seams. D: wide-legged. All are semi-fitted through hips. Designed for light- to medium-weight woven fabrics. FABRICS: Crepes, Faille, Satins. 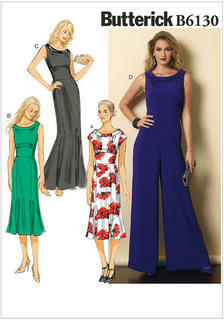 This stylish New Look pattern includes dress and jumpsuit with V-neck and front zip. Jumpsuit has sleeves in two lengths and tapered leg. Dress is featured in two lengths with optional belt.